Top row: Stug III, Ferdinand/Elefant size comparison; Customization of P-40 model (AVG, Flying Tigers). 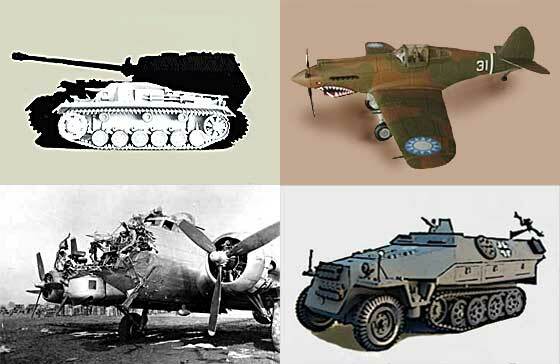 Bottom row: The B-17 in Combat; Comparison of the American and German Half Track. Top row: American B-25 Mitchell; German 87 Junkers (Stuka). Bottom row: Japanese Zero; British Spitfire. 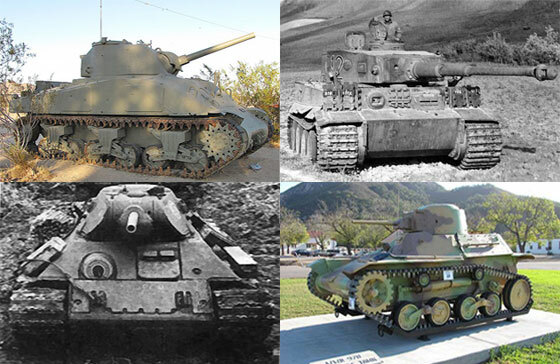 Top row: American Sherman; German Tiger. Bottom row: Soviet T-34; Japanese 97B. 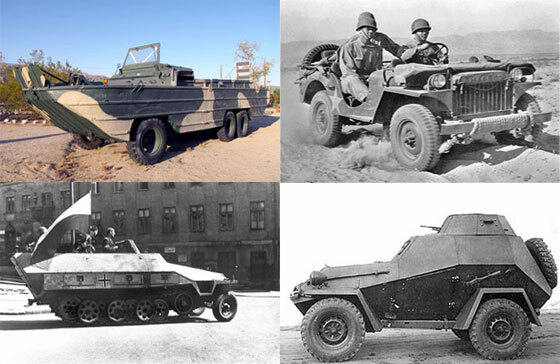 Top row: American DUKW amphibious truck; American Jeep. Bottom row: German SdKfz 251 armored vehicle; Soviet armored car. 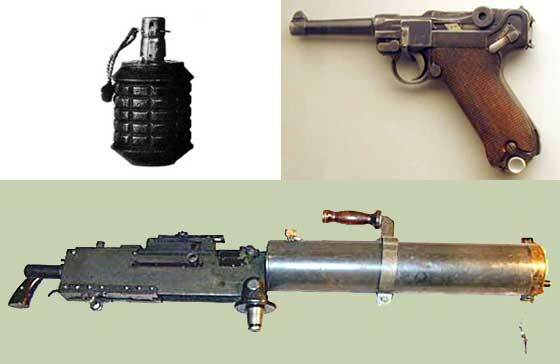 Top row: Type 97 Fragmentation Hand Grenade; German Luger pistol. Bottom row: Browning M1917 Machine Gun. 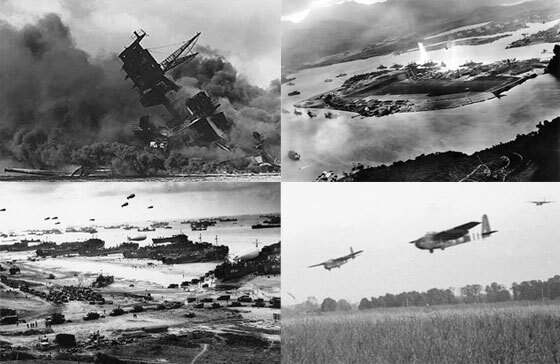 Top row: Sinking of the USS Arizona; aerial view of Japanese attack on Pearl Harbor. Bottom row: Massive landings of the Normandy Invasion; Giant British Hamilcar gliders. Right: Nazi recruitment of the French. 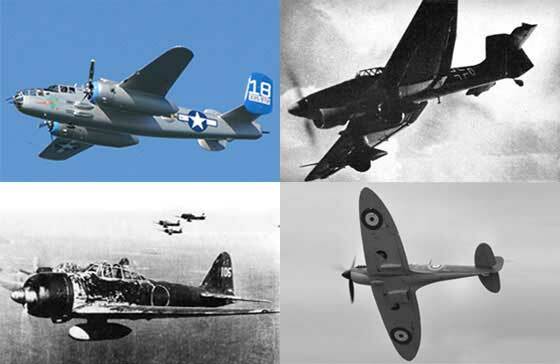 Our website includes articles and photos of WW2 aircraft, tanks, transport, and weapons for both the Allies and Axis. 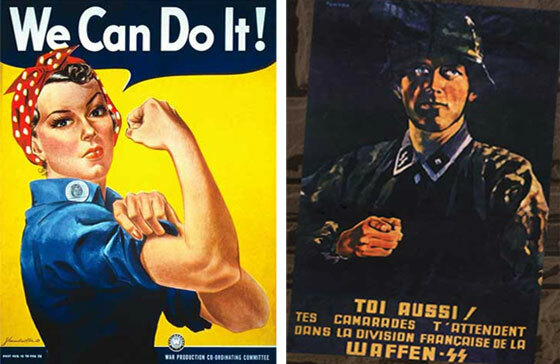 Also covered are major battles, posters, museums, and air shows. Due to the vast size of the topic this is an on-going project. Links to the latest articles are shown in the right sidebar of this page. Use the navigation near the top, or to the left of the page, to find links to our articles, photos, and Jon's WW2 weekly blog. Or use the search box in the upper right. To return to this home page, click on the WW2HQ logo at the top, left, of the page. Jon's WW2 blog will cover various topics including: WW2 related articles I run across, book purchases for my WW2 library, my WWII models teaching collection, etc. * Formerly TimeMoneyAndBlood.com. We have changed the name of our website to WorldWar2Headquarters.com (WW2HQ.com) because we feel it more closely aligns with the subject covered on this website.